Based on Remote Sensing technologies, integrated with a WebGIS system, MARCOAST is a service designed to realize a distribution via internet of Coastal and Marine monitoring services. All the data provided are obtained by integrating satellite data and other information. All their data are provided as a product that users can view and download by using a navigation interface showing cartographic maps of the desired areas. 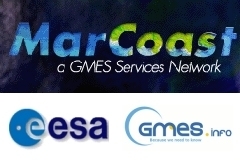 MARCOAST project (Marine and Coastal Environment Information Services) has been realized under the ESA`s (European Space Agency) GMES Service Elements program and points at establishing a durable network of marine and coastal information services tailored on European users. Planetek Hellas operates as a Water Quality Service provider for the Greek seas. End user for the test services realized over the Ionian and the Aegean Sea is the Specail Secretariat for Waters of the Hellenic Ministry of Environment. Harmful Algae Bloom monitoring and forecasting. MarCoast is currently carried out by an international consortium including 32 partners and provides periodically a large variety of products to support the management and monitoring activities towards european coastal zone, in term of water quality, Algae Bloom accumulation and Oil spill. Planetek provides also a service designed to collect and grant a daily monitoring activity, in Near Real Time, of all water quality indexes. The areas towards this service is provided apart from the Aegean and the Ionian Sea, are the Adriatic and the Tyrrhenian seas, where periodically are made Clorophyl Maps, Surface Temperature Maps and Water Transparency Maps.